Agnes has been a local resident of the Peace Country for most of her life. She is a wife, mother of three and grandmother of seven grandchildren. 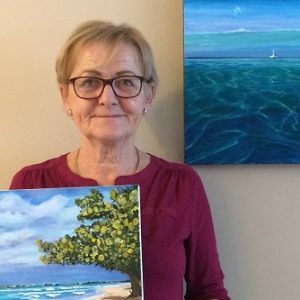 After her retirement from a 20 plus-years career as a teacher, she has now become devoted to a new passion; acrylic painting. A self-taught artist, McDonald has improved her craft by dedicating herself to spend many hours painting, reading books and watching various artists on TV and You Tube. She has also taken a few art lessons. She predominately paints landscapes with colors that are both bold and vibrant. By observing nature’s beauty both at home and first-hand during her many trips to the Caribbean and British Columbia, she tries to capture the images that inspire her. Among a variety of elements, sunrises, sunsets and water will be found in most of her works.